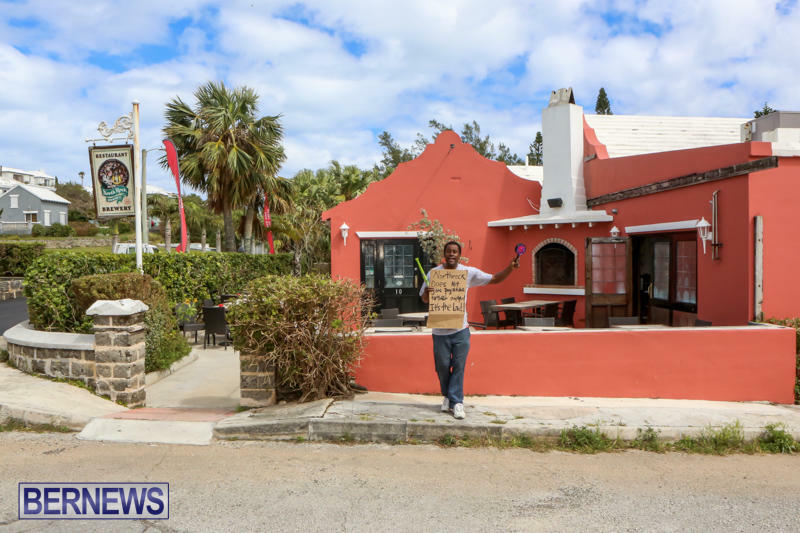 A one-man protest took place outside of North Rock Restaurant on South Road this afternoon [March 2] with the protest, which resulted in the police being called, centered around some form of issue alleged to involve pay stubs. The protester, who identified himself as Carlos Swan, told Bernews, “My boss wants to call the police to get my pay stub. If he wants to give me my pay stub now, how come he couldn’t give it to me when I was working here? “He wants to wait to police come, I called the police and now he wants to give me all my pay stubs? If that’s the case, if he want to give me my pay stubs, he should give me my 2016 vacation pay too…and then I accept my pay stubs,” added Mr Swan — who was shaking a New Year’s Eve noisemaker while holding the protest. In response to the situation, Omar Hamed, who works at North Rock, told Bernews that he got his pay stub and he thinks everyone else did too, and also alleged that Mr Swan stopped working for the last 5 weeks. The police attended the scene, and a few people also gathered to watch as the protest was underway. Just as OBA would fitbright in with Trump . Bunch of followers . General Election cant come soon enough i know my ppl have learned their lesson. You that kid that spent hours trying to fit the square block in the circle hole, weren’t you? You’re delusional…The PLP followers are more representative of Trumps followers….bigots, racists, misogynist…should I go on? You don’t have a fricking clue, which is sad. …..and you definitely WOULD NOT. Too busy being inhumane and racist!! When Black people realize that after 400 years of FREE labor and making Europeans wealthy, your services are no longer required. They have a new wave of modern day slaves. Until you realize that you would be more at ease. You have enslaved yourself Onion Juice. Free your mind and be your own boss, start your own business…Nothing stopping you but yourself. Ya, but on a whole we still live in a Racist society and it needs to be delt with accordingly. Just like in de days gone by. Mugabe-esque. How’d that work out for his country? This is so sad.. MY PEOPLE ARE SUFFERING !!!!! Wake up! Very Sad ! And they say this osland isnt divided im sure we can see clearly now . Another going on something alleged. There’s always more than one side to a story. To smh……..the dislikes(42) which your comment has received is a direct indication that there are too many racist, biased,being on this island. … illness has not gone away since slavery was in place, then abolished!!! @ have some backbone…check your mirror…you’ll find one staring back at you !!! You don’t know what suffering is. Bermudians are not suffering!! So in your view Cathy things should be worse for Bermudians? They could be a lot worse,for everyone,you just do not know ant better. That is a silly comment. Surely you can see that you made a silly comment as plane as day ! Future civil servant – only place you get a fair shake. Well I see that the Donald Trump voters, “Pooty Tang Johnson”and “San George” are weighing in as expected. Donald Trump is against immigration, spews divisive rhetoric while his supporters call for anarchy, unrest and violence. So exactly which segment of Bermudian political supporters truly resemble Trump supporters? Be honest with yourself even though you might not like the answer. Do you really want that answer? Which part of Bermuda has nothing to say except how much they hate foreigners? I think we know the answer to thst. Its called reverse Racism. Like Trump has no clue about David Duke and KKK !!!!!!!!!!!!!!!!!!!!!!!!!!!!!!!!!!!! David Duke has renounced all ties to the KKK has moved on to a far more important agenda-I am of mixed race and I agree with many things he has to say. But I am against cheap legal Labour in Bermuda, it is the root of all our issues..
What a daft statement. Are you willing to pay 20% more for groceries so that marketplace can pay $25/hr to shelf packers? Government pays lots, but who actually pays in the end? Us. But that shelf packer has to pay $2000 a month for a one bedroom, while the foreigner gets paid slave wages and has 10 people to help them pay their rent. And they shelf packers does not have 10 people helping them? 10 Bermudaians could easily help each other to rent a place. But there would only be 1 parking spot. WHere are all the sporty cars going to park? So you are willing to vote for liars? I have to give it to Hilary, she does tell a good sniper tale. I would rather vote for Bernie. I won’t be voting for either party so I hope there’s some good independents running. John Barritt should run as an independent. He could do a better job than anyone in either party and has more integrity in his pinky than they have all together. Socialist Bernie? I truly hope you can not vote in the USA. Yes police all over this one! Bully boy tactics! The OBA will now have a referendum about whether he got his pay stubs. Silly Mike don’t you know OBA only has referendums when they want to play pontius pilate? On other occasions referendums are deemed too expensive. Haven’t you learned yet that OBA has their own agenda just as PLP did. When they want an amendment they push it straight through. Just like DREB they feel they have to deceive you. Hike Mind doesn’t do politics anymore … Every since the scandal with jetgate , something changed in his keyboard strokes . I mean this is perhaps the only time in many , many post that he has put an O and a B and a A together as a description of anything . This is the first time I can say I’ve see MIKE HIND comment outside of an article on equality based one sexual orientation. Since you seem to be the slow one, and amazingly the quickest sperm to reach the egg, Mike was taking a jab at the OBA’S stance on equality… you helped WiseArs to try and fit the square peg in the round hole, didn’t you, Offeec? That’s pig Latin for the slow one. I got sick of putting up with stupid, baseless personal attacks from trolls like you. I got sick of being accused of being an OBA supporter and then having to explain to you, over and over, that I wasn’t, then having to put up with you complaining about me repeating myself. I got sick of demagoguery and cowards like you who are willing to lie and slander and libel people to promote a political agenda. Especially when I don’t have any skin in that game. Nothing I was saying was making a difference. It wasn’t helping Bermuda. Neither side listens. Neither party gives a crap about me or Bermuda or doing what’s right. So I made a decision to only post on one topic. to only post on something that I think I can actually make a difference on. So, that’s what I do. I know you’re desperate for me to be something I’m not, because that would make you right about something, one thing, finally. But, as per usual, you aren’t. Sorry to disappoint. See, this is what I’m talking about. Outright lies from a pathetic troll hiding under the hood of anonymity. THIS is why I stopped posting. This hecklers veto. Not once have I ever been a supporter of a political party in Bermuda, but this lying idiot can push this outright fabrication, based on nothing but the fact that I dared call him on his constant lying about both parties. When faced with constant personal attacks like this, I chose to take the route of personal mental health and stopped posting. I am not, nor have I ever been, a supporter of either political party. When asked for any evidence of this, “Coffee” will disappear into insane ranting, or just plain disappear, only to show up again pushing the same lies, with no evidence. “Coffee”, however, is a very vocal, vehement and blind supporter of the PLP and has a very long history of posting propaganda and outright falsehoods in order to promote a political agenda supporting his party. He has relentlessly trolled myself and others repeatedly in an attempt to silence us and, in my case, succeeded. This very thread is a perfect example of how he behaves. Ya, but you’ve BLASTED P.L.P on a continuous basis and was hush on U.B.P.’s Bull S! @# policies. That’s like a white person saying I’m not racist but keeping silent when they see racism !!!!!!!!!!!!!!!!!!!!!!!!!!!!! You are lying, yet again. These partisan hacks continually spreading lies and misinformation about people that disagree with their agenda and dare speak out. Yes, I blasted the PLP when I thought they were doing wrong. But I did the same for the OBA, the UBP. I also praised those parties when they did what I thought was right. But trolls like these two can’t have that. It’s party all the way, party can do no wrong, and I, for one, think that’s bad for Bermuda. These two are just mad that they constantly got exposed for the lying party tools that they are. If Hike Mind wants to stay employed , he’d better to the OBA line . As a local entertainer in the public eye , he remained silent when Micheal the Usurper gave job opportunities to foreigners over Bermudians … Talk about blind support ! You need a seeing eye dog Hike Mind ! Or he could be like you….do anything in your power to get your “poeple” elected in the hopes that a small bone might be thrown to you. Nothing else matters, just that tiny little bone. Yes like DREB, the Oba lies and makes no apology…. Looks like the police paid more attention to this than they do if two dozen people block off East Broadway. He hadn’t been at work for five weeks. It was a waste of police time. Clearly you don’t know the definition of the word alleged. The person who’s word you’re going by “thinks” everyone got their pay stub but knows the particular employee got his. Speculation is a waste of time but I guess you have nothing better to do since I see that you do a lot of that in your posts. The police are not supposed to sort out employment disputes. unless he was disturbing traffic or threatening someone, it was a waste of their time. If he wants to take off weeks on end, he should apply to the civil service. He could take 5 weeks off sick, amd still have 6 weeks left to take off in the same year. Plus his proper vacation time. That sounds like a career that might suit him better. the police respond when called, if no offenses have been committed, then they will leave. Thats their jobs, its never a waste of time. Once more you are speculating. It seems to be that the employer called the police but I will ask Carlos when I see him instead of ASSuming as you do. Why would Carlos call the police? If the employer did he is the one wasting the police time. Also taking an alleged story for truth about him taking weeks on end off. How do you know that Carlos wasn’t told he was fired or that he didn’t quit? Maybe the person who made the statement about him not being at work didn’t know the whole story so they assumed as you did he just didn’t come to work. “when I was working here?” is past tense. Im really lost here – what is this about? I honestly just don’t get it? what is so important about the pay stubs? Actually very important – regarding deductions and has the insurance company, social insurance, pensions etc been paid for him. without the stubs he can not prove deductions were made. That’s why it should be law that everyone fills out an annual tax form and sends it in with their pay stubs. The government shouldn’t have blind trust in tax payers. We could be losing millions in unpaid taxes because the employer pockets it and fixes their accounts and government would be non the wiser. Even though it happens in Bermuda it’s not a good practice to except wages without getting a paystub. And we will have a whole new department of civil servants checking pay slips – slips that show that deductions were made, but do NOT show that appropriate payments were in fact made for health insurance, social insurance, whatever. Oh well, another way of employing the unemployable…. There already is a department dealing with payroll tax so I don’t see why they can’t add to their duties. People in the private sector take on new duties all the time. Get rid of the inefficiencies if that’s what the issue would be. Health insurance & social insurance deductions should be on a payslip also and should be checked as sometimes they are not paid. Workers being denied medical treatment and seniors not having enough in their pension because an employer has pocketed the money is a terrible thing. Its my understanding that amy employers are taking pension , insurance ect out and are not paying the fees to the nessessary places. So having a pay stub gives the worker a record of what hours they work and what was taken out.Many and I mean a whole lot of companies are not paying what they are taking out and of you have no paystub you have no proof of ever even working ! A lot of underhanded stuff gets done. I bet most employers haven’t even read the employment act. Every employer is supposed to have employment contracts signed by their full time employees. If the employee is not living up to their contract the employer is supposed to write them up and have the employee sign the notice. Three of these notices and the employer then has the right to fire the employee without redundancy pay. There’s no confusion as to why they were fired because the notices were signed by both parties. Many times employment is terminated without the employee even knowing why which should be brought to the tribunal but isn’t because the employee hasn’t read the act either. If employees want to complain about Bermudians then they should go by procedure to gain proof that Bermudians are the way they say they are. 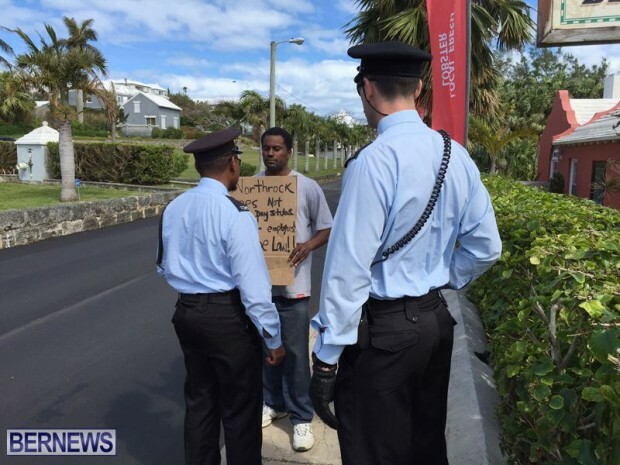 Other than that the employer is just stereotyping to have an excuse not to hire a Bermudian. All an employer is saying when they have no documented proof is that they have poor business management skills and would rather hire a foreigner so they can hold their permit over their head as a threat. All of what you say is absolutely spot on. But like many initiatives in Bermuda that are in place to protect all parties, there is very little enforcement to ensure that these practices are carried out. It’s actually illegal to withhold pay stubs. As if the union would do anything for him without membership fees. Hopefully this would be a warning to others. If he doesn’t get hired for this, then the business has something to hide. This is a matter between this gentleman and his past employer.this is not protest of any political issue. Give the man what he is do and let him move on with his life. Good my brother is will give you a job anytime. Good my brother i will give you a job anytime. Bermudians can be trained to do jobs. Here is a job posted, lets se who will be applying or let’s actually see who will be taking this position. EMPLOYMENT Carole Holding Ltd. is looking for a Retail Accounting and IT Manager with retail experience. The successful applicant must be willing to teach other members of staff. Please send resume to: Carole Holding Ltd. 73 Harbour Road, call 441 535 4000. Good luck to those applying. By the way if you get the job and you run out of accounting work, you can manage the cash register. And make $25/houre. Well we know you wont apply being you cant spell hour. to speak in the whining tone of a beggar; beg. A fitting word for an idiot who lives in a glass house. I recognize that guy. Great bartender! Hilarious The add didn’t specify to train Bermudians so I guess guest workers can be trained too. There are guest workers who get trained. There’s even times when a local trains them and then the employer sacks the local and keeps the guest worker on. IT DOES HAPPEN although some will continuously say that it doesn’t. As long as Bermudians allow this act to happen, serves you right. Only Bermudians allowing this to happen are the ones in immigration approving permits without checking that the foreign worker is really qualified. The worker training the permit holder has their back against the wall to either train them and run the risk of losing their job to the trainee or to refuse and still lose their job for not training them. If what this man was protesting for was real, I agree with him 100%, but the question I must ask if it is true of this company and many others, why is goverment not going after them, hello there is enough payroll tax money out there being owed by companies that would make a little dent in our debt! This is probably the same sort of response that would be given to your question. The PLP are such dimwits they didn’t even make a statement about this answer when Minister Fahy claimed measure had been taken to stop permit violations. Just makes me wonder if the opposition are reading questions someone else wrote for them that they have no understanding of. Fabricated truth, i.e. A lie. That’s what you lot do all the time isn’t it. You are tooooo funy! Ever thought about stand up comedy? You must of had your selfie camera on when you typed this one since the only fabrication is done by you. Unless the government clerk is uploading fabrications to the internet which I highly doubt. When you call someone out you best brace yourself for the challenge. Try spinning this one Zevon. While I am not sure what is going on in this particular instance l would sincerely ask that all employers do the right thing and pay staff a decent wage, honour the laws of Bermuda and pay the health and social insurance deductions as required by law. Accordingly, the employee must also honour his/her side of the bargain and show up on time and do a proper day’s work. For you guy , in your honor , me and mine will dine elsewhere when we could afford to eat out . If you avoid all restaurants that don’t pay employees who fail to turn up for weeks on end, you should plan on eating at home. A lot. I can afford to eat out and will be eating there as I have saved for the rainy days unlike you@ coffee! When the PLP were spending stupidly against advice was the cue for people like me to save save save ! And yes,, thank you to the protester and protesters. I now know who not to hire! Save it all .. But you’ll never take it with you . I’ll bet the only person you’ve hired in your lifetime is a cab driver ! More to this story obviously. Kudos to you young man, protesting without hindering anyone else’s civil liberties. On another note, Northrock I won’t be patronising your establishment until I hear the whole story and am convinced that this young man has been kept whole. So don’t look for me Friday night. It is difficult and expensive to go thru different avenues to get a pay stu b. The worse thing in today,s economy is not having a job, the story says he has not worked in five weeks, so is he on sick leave ? Is he a former em ployee,recently terminated or did he resign ? A pay stub is essential to kn ow the deductions etc, etc. The police attend to virtually all calls from the public, what is common to them is traffic or criminal. Domestic, civil and employment and similar areas they might suggest the person(s) see their respective lawyers. Now a lawyer will start at around $400 per hour. The gentleman,s concern seems to be a pay-stub, there really has to be somethin g else going on. There is a lot of stress out here and the economy is not good thus a multitude of situation s exist or are likely to occur, so I think it good that Government along with helping agencies speak to the public from time to time. This gentleman should have been directed to the Labour Department of Government to help him with any complaint about said employer. Out people don’t seem to know anything about anything.